BOOK: “The Touch of Civilization” Comparing American and Russian Internal Colonization. Boulder: University Press of Colorado, 2017. “In Search of Citizenship: The Society of American Indians and the First World War,” Oregon Historical Quarterly 118 (Summer 2017), 268-272. “‘It was a pretty good war, but they stopped it too soon’: The American Empire, Native Americans and World War I,” in Empires in the First World War, edited by Andrew Jarboe and Richard Fogarty (I. B. Tauris, 2014), 193-216. “Comparing American and Russian Internal Colonization: The ‘Touch of Civilization’ on the Sioux and Kazakhs,” Western Historical Quarterly XLIII (Spring 2012), 29-52. Winner, 2013 Arrell M. Gibson Award given annually by the Western Historical Association for the best essay on the history of Native Americans. “Making a Home for the Other: Kazakhs, Sioux, and Self-Determination in Soviet and American Contexts, 1920-1930s,” in The Soviet Union and the United States: Rivals of the Twentieth Century, Coexistence and Competition, edited by Eva-Maria Stolberg (Peter Lang Edition, 2013), 61-86. Russian Colonization and the Genesis of Kazak National Consciousness. Palgrave-Macmillian, 2003. “International Terrorism and Central Asia”, Central Asia and the Caucasus (#5, 2008), 139-45. Turkmenistan: Flawed, Fragile and Isolated”, Stable Outside, Fragile Inside? : Post-Soviet Statehood in Central Asia, Edited by Emilian Kavalski (Surry, England: Ashgate, 2010) 175-94. Central Asian and Russian History, First World War, Nationalism and National Identity, Soviet and Post-Soviet nationalities policy, Imperialism and Colonialism, and American West. Ph.D., Georgia State University, 1998. 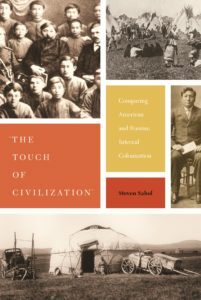 I completed my book, ‘The Touch of Civilization’: Comparing American and Russian Internal Colonization, published by the University Press of Colorado in April 2017. In addition, in May 2017 I participated in a series of public conversations devoted to the First World War in Oregon, sponsored by the Oregon Historical Society. I also co-edited a book, with Abdulvahap Kara, and Bekir Sadik Topaloğlu, Soviet Historiography and the Questions of the History in Kazakhstan: A Retrospective of the life and work of Ermukhan Bekmakhanov, Istanbul: Union of Turkish World Municipalities, 2016. Currently, I am completing a co-edited book project with my colleague, Shep McKinley, North Carolina’s Experience during the First World War, scheduled for publication by the University of Tennessee Press for sometime in mid-2018. I continue to work on several books in the “Russia’s Great War and Revolution” series, my project about the Montana Council of Defense during the First World War, and I am local arrangements coordinator for the Southern Conference on Slavic Studies, which will meet here in Charlotte in March 2018. Finally, as part of my continued efforts with genealogy, I am writing two articles about my Swedish ancestors, who settled in Worcester, MA, in the 1890s. One essay uses my grandmother’s letters, written in 1923-1924, as she spent a year in Paris studying violin with Professor Bron. It is a unique collection, more than 100 letters, that reveal a fascinating portrait of Paris in the mid-1920s through the eyes of a nineteen year old. And, the second essay, examines the March 1940 apartment fire that the press called the “worst in the city’s history,” which killed five.